In a previous article written about the biography of Chief Bautista. Bautista, Robert Howard, was the most important captain of the Mariposa County Southern Sierra Miwuks. He is considered the patriarch of the Miwoks and many are descendent from Chief Bautista. Yosemite National Park booklets claim Bautista was the Miwok captain of the Yosemite Native Americans. Let’s examine the reports about Chief Bautista’s early life and also the legends of the Southern Sierra Miwuks which California Indian ethnologist C. Hart Merriam wrote about in the early 1900s. 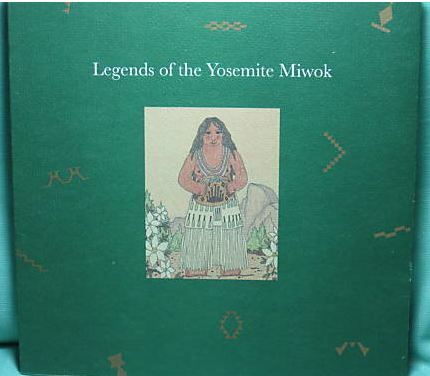 Merriam’s writings ended up in the book “The Legends of the Yosemite Miwok” published by the Yosemite Association. In his book “Deeper than Gold: Indian life in the Sierra foothills” Brian Bibby writes that Chief Bautista was captured in the tule marshes surrounding the San Juan Bautista Mission located in San Benito along the Pacific coastline. The Missions located along the coast from San Francisco to Los Angeles would have local Indians in these missions and schools as priests tried to Christianize their local Indian population. The same thing happened to Chief Bautista after he was captured as a child. Bautista came from the surrounding tule marshes either along the coastal range or in the interior of the San Joaquin Valley near the Mission Bautista. In early times there were large tule marshes in the Central San Joaquin Valley. In Bibby’s autobiography of Chief Bautista he writes that Bautista is not a Potoyencee [Miwok], but a Luttasme. There is no Luttasme tribe in the Yosemite area recorded in Galen Clark’s book “Indians of the Yosemite Valley and vicinity: their history, customs” or in A. L. Kroeber’s “Handbook of Indians of California”. Nor is the Luttasme mentioned in other books of the early Yosemite and Mariposa area Indians. This means that Bautista is not originally from Mariposa or the Tuolumne County tribes. Chief Bautista was probably from a tribe in the surrounding Mission San Juan Bautista or western Central California. Chief Bautista’s wife was the Poyotencee Miwok. But in “On the evidences of the occupation of certain regions by the Miwok Indians” published by A. L. Kroeber in 1908, Kroeber, using C. Hart Merriam’s work, wrote that there was a Lakkisamne tribe, but this tribe was located along the streams coming from the San Joaquin River that runs directly through the Central Valley. The Lakkisamne were from the Upper Central San Joaquin River region which would be around the same place that Chief Bautista would have reportedly come from. So Merriam’s Lakkisamne is probably the Luttasme written about in Bibby’s book. This means Chief Bautista was an Upper Central Valley Yokut and not a Yosemite Miwok. Map showing California Indian tribes with location of Mission San Juan Bautista, and the San Joaquin River. The star in the right is Yosemite and the thin red line is the Mono Lake Paiute territory. If you look at the map above of pre-contact California Indian tribes. I have marked where the Mission San Juan Bautista is located. The map is a map of the tribes of California at first contact. 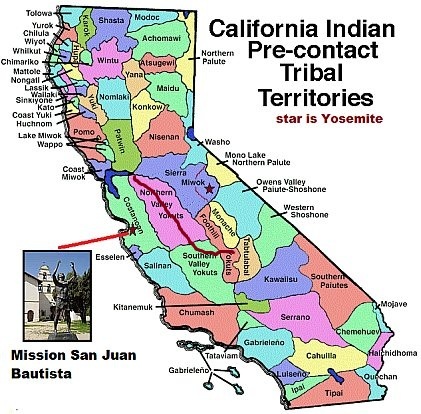 Note that the tribe in the area of Mission San Juan Bautista is the Costanoan tribe. To the east of the Costanoan area is the vast Yokut area that covers Central California. Only in the foothills where the Spanish seldom ventured is the Miwok area. Many Mission Indians escaped the missions and would hide out in the Sierra Nevada foothills far away from the Spanish military. The Spanish military seldom ventured into the Sierra Nevada. So it would make sense that Bautista would join his wife’s tribe along Lake McClure in western Mariposa County to escape the reach of the Spanish army. The Poyotences made Bautista their chief, but he was not an original member of their tribal group. This leads us to the early writings of C. Hart Merriam and the legends of the Southern Sierra Miwok. C. Hart Merriam visited the Mariposa and Tuolumne area to document the legends of the Indian people of that area. Remember by 1854 Chief Tenaya’s Ahwahneechee people had already been decimated and re-absorbed into the Mono Lake Paiute population by the time Stephen Powers went to visit them in the 1860s and later by Merriam. So Merriam was basically taking down the legends of the white’s Indian workers who had settled in the area after being brought up to dig their gold. C. Hart Merriam recorded the legends of the Indians who had moved further up into the foothills from the San Joaquin Valley floor. Merriam, who did not live in the area, but found informants from the Southern Sierra Miwok tribe and recorded their myths and legends. It is a very extensive work done by any California Indian Ethnologist and Merriam’s work is used today by many Indian ethnologists and the Yosemite National Park Service. But, here is the problem with Merriam’s Southern Sierra Miwok myths and legends, it turns out that they were really western Yokut and Costanoan legends, not “Yosemite” Miwok legends. Frank Latta, also a very well known California Indian ethnologist who studied the Central Valley and Central foothill tribes had a problem with Merriam’s work. First Merriam didn’t live in the area, while Latta lived in the local area and grew up as a child amongst the Central California Valley Indian people. Latta knew the people very well. Latta recognized that C. Hart Merriam’s Southern Sierra Miwok myths and legends were mainly made up of legends from the Coastanon and far western Yokut tribes. They were the same legends that Chief Bautista probably heard as a child from his Luttasme [Lakkisame] Yokut tribe. These quotes were from pages 89 and 90 of Mr. Latta's book, which means that "Miwok" stories and myths found in the book published by the Yosemite Association “The Legends of the Yosemite Miwok” are really Yokut stories and NOT Miwok. Also C. Hart Merriam, who wrote down those "Miwok" tales, conceded to Frank Latta in 1930 that he had been mistaken and that the "Miwok" he wrote about were really Yokut tales. 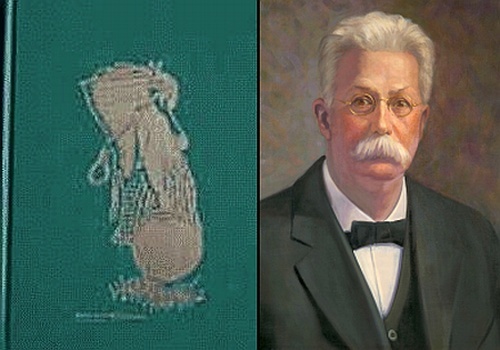 Frank Latta's book "The Handbook of the Yokuts" and a portrait of C. Hart Merriam. Merriam is the same person who wrote the Miwok place names of Yosemite. It appears he was getting the wrong information and conceded this to Frank Latta the author of the Handbook of the Yokuts. The majority of the “Yosemite Miwok” myths and legends used by Yosemite National Park are Yokut tales that actually came from the western San Joaquin Valley. This is the same location that Chief Bautista came from. If Chief Bautista, who was not a Poyotence Miwok, but a Luttasme Indian, came from the Coast or western San Joaquin Valley floor then he probably brought his tribal stories, myths and legends to the Mariposa and Yosemite area. This means that Yosemite National Park Service is using Costanoan or Upper Central Valley Yokut tales in the Park to promote the myth of the Yosemite Southern Sierra Miwuk, instead of the original tribe, the Mono Paiute. So when you read the book published by the Yosemite Association titled “The Legends of the Yosemite Miwok”, and also read the signs in Yosemite National Park, those tales were tales probably brought in from Chief Bautista, who was not a Miwok.